KLANG: As concerns grow over the continued rise in inflation in healthcare — projected to go up by 12% this year — one player believes its “small hospital” business model can help keep costs lower. Columbia Asia Sdn Bhd said its hospitals are smaller than traditional hospitals and designed for short lengths of inpatient stay. 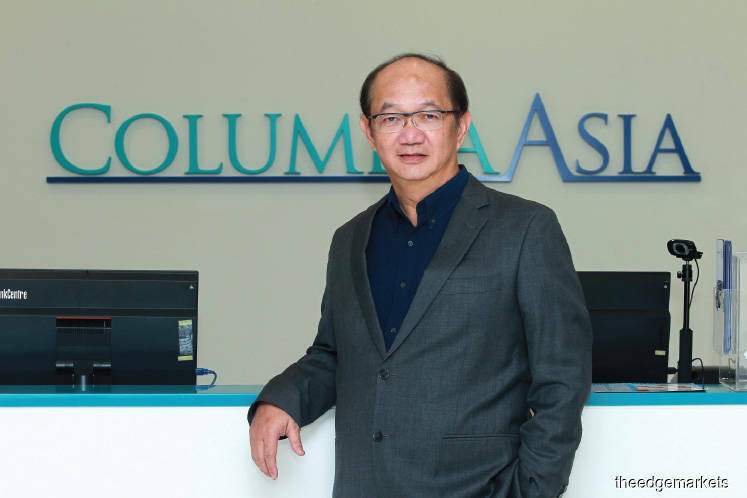 Speaking to The Edge Financial Daily at the group’s newly opened hospital in Klang recently, Tan said the founders of Columbia were of the view that building big hospitals was not the ideal model for the future. “When you build big hospitals, you end up incurring a lot of structural costs, maintenance costs, utility bills, manpower costs and so on. All that is a cost that has to be transferred somewhere. “The question is where does it get transferred to? The patients’ bills,” said Tan, adding that patients’ claims from insurers would then inflate costs. Columbia Asia was founded in 1996 and operates 12 medical facilities (a mixture of hospitals, clinics and extended care facilities) in Malaysia, and another 11 in India and three each in Indonesia and Vietnam. The group is 30% owned by the Employees Provident Fund and 70% by a US-based fund, the International Columbia USA LLC. So how can small hospitals help check medical inflation? Tan said keeping the hospital size and capacity small has allowed the group to control its costs and keep excesses down over the past 20 years. The group also has a central governing policy on the running of each of its medical facilities. Columbia Asia’s Malaysian operations registered a revenue of RM550 million for the financial year ended March 31, 2017. The group has a current annual growth rate of 18.9%. Tan said another way to control costs is in cutting down the average length of stay of a patient, which he believes Columbia Asia has achieved with better and more efficient care of patients, citing increased technological use as a main driver of this efficiency. Tan said the average length of stay at Columbia Asia hospitals is two days, lower than the 2.5- to three-day period at most other private hospitals. “To be honest two days is enough ... . After the 48 hours, it’s just recovery costs and that cost could be easily 15%-20% of the patient’s bill. It may not be a lot but it is still an inflationary element,” he added, stressing that this additional cost could easily be avoided. For Columbia Asia, one main technological upgrade that has benefited the group is its move to install a hospital information system on its computers to allow doctors to access patient information more speedily. Tan said this has allowed its hospitals to go paperless and make better decisions on patient recovery, a significant difference compared with other hospitals which still practise conventional paper administrative methods. Tan, however, expressed caution about the adoption of technological use at hospitals, as unnecessary use of expensive technology is another main driver of medical inflation, he said. “Yes, the technology can help with matters such as precision of a diagnosis, for example, [thus] helping reduce human mistakes so that the patients need not return to the hospital again. But it could also be mildly beneficial, at a huge inflationary cost. So, to us, incorporation of technology is a cost-benefit question,” he said. Tan concluded that medical inflation in essence is not just about the cost of medicine or medical devices used. Simple practices of efficiency can make the difference and he, therefore, encourages other hospitals to adopt this practice. The group’s latest hospital, costing RM100 million, is located on a two-acre (0.81ha) site in Klang. Moving forward, Tan said Columbia Asia will be building new hospitals in Tebrau, Johor Baru and Batu Kawan, Penang, slated to be completed by the end of 2019. The group will also be expanding its existing hospitals in Iskandar Puteri, Bintulu and Seremban to accommodate growing populations, although they will still keep their hospitals small.